Adelle Dubblestyne graduated OCAD University with a Bachelor of Design in spring 2013. 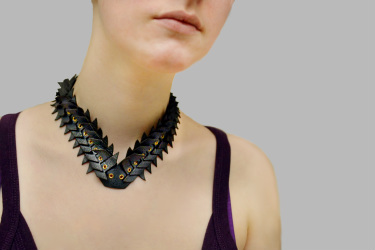 Specializing in Jewellery and Metalsmithing, Adelle developed an interest for alternative materials and new technologies applied to the field of jewellery design, creating unique wearables with intricate details. As an emerging artist, Adelle continues to experiment with materials and techniques to develop a range of experience, engage in innovation and learn through practice. Adelle would be happy to hear from anyone regarding sales, commissions or general comments and feedback.